Mark Miskimmin has played for Linfiled, Glenavon, Donegal Celtic, Glentoran and Coleraine. Newly-promoted Carrick Rangers have signed former Linfield and Glenavon Mark Miskimmin striker on a one-year contract. 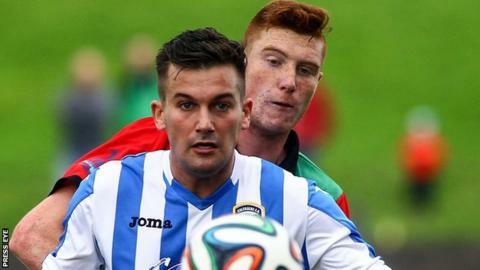 Miskimmin, 27, was most recently with Coleraine, and Carrick will be his sixth Irish Premiership club. Rangers boss Gary Haveron has also brought former Crusaders goalkeeper Chris Keenan back to the club as they prepare for their top flight return. Last season Keenan played for Amateur League club Islandmagee. Miguel Chines, whose 28 goals helped Carrick win the Championship, Intermediate Cup and Steel and Sons Cup last term, is staying on at the County Antrim club. The 35-year-old from Portugal has signed a one-year contract extension. "Miguel's goals were instrumental in our success last season and we are hoping that he can continue this form as we enter the Premiership," said club chairman Peter Clarke. Carrick, who were relegated from the top division in 2012, are away to Dungannon Swifts when the league campaign starts on 8 August. This Saturday they visit Amateur League club Ards Rangers for a pre-season friendly.